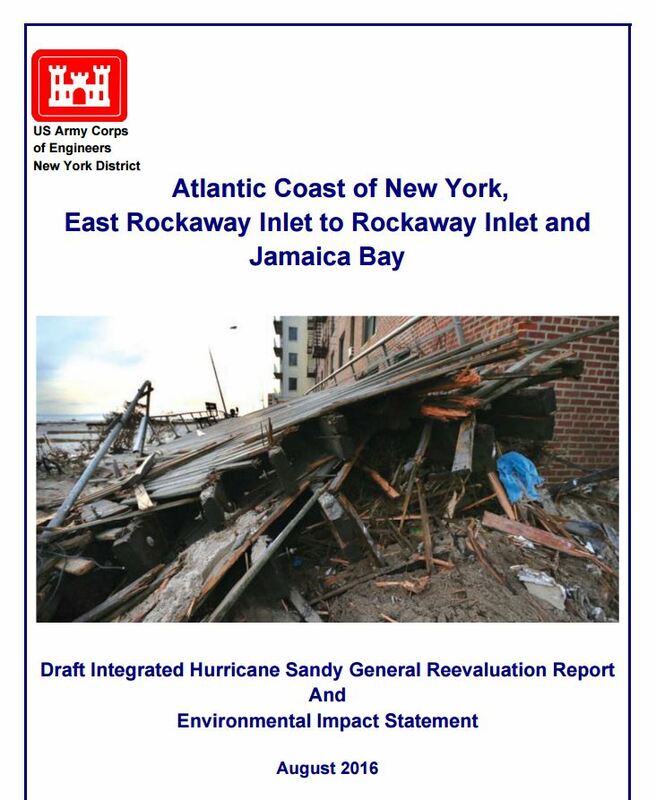 The U.S. Army Corps of Engineers last Friday released the highly anticipated Draft Integrated Hurricane Sandy General Reevaluation Report and Environmental Impact Statement, or Rockaway/Jamaica Bay Reformulation Report, which examines coastal storm risk management problems and opportunities for the East Rockaway Inlet to Rockaway Inlet and Jamaica Bay project area that was devastated by the impacts of Superstorm Sandy in October 2012. The long-stalled analysis will ultimately determine the best possible coastline defense to protect the whole Rockaway peninsula and communities surrounding Jamaica Bay from storms and floods in a way that is sustainable over the long-term, both for the natural coastal ecosystem and for nearby neighborhoods. The Tentatively Selected Plan, with a price tag of several billion dollars, extends along approximately 152,000 linear feet of project area from the eastern end of the Rockaway Peninsula at Inwood, Nassau County, to the western end of the peninsula, at Breezy Point, where the plan wraps around the existing shoreline past the Gil Hodges Memorial Bridge. Near Jacob Riis Park a storm surge barrier crosses Rockaway Inlet landing at Floyd Bennet Field, Brooklyn. The plan continues up Flatbush Avenue before turning west along the existing shoreline and continuing west until Norton Point. From Norton Point, the line of protection continues on the north side of Coney Island, crossing Coney Island Creek. From Coney Island Creek it continues north along the shoreline to high ground. A reinforced dune (composite seawall) with a structure crest elevation of +17 feet (NAVD88) and dune elevation of +18 feet (NAVD88), and a design berm width of 60 feet extending approximately 35,000 LF from Beach 9th to Beach 149th. The bottom of dune reinforcement extends up to 15 feet below the dune crest. Obtaining sand from borrow area located approximately 2 miles south of the Rockaway Peninsula and about 6 miles east of the Rockaway Inlet. It’s about 2.6 miles long, and 1.1 miles wide, with depths of 36 to 58 feet and contains approximately 17 million cy of suitable beach fill material, which exceeds the required initial fill and all periodic renourishment fill operations. Extension of five existing groins; and construction of 13 new groins. Reinforced Dune along the shoreline in Reaches 1 and 2 of the Atlantic Coast Planning Reach, from Beach 149th Street to Breezy Point. Levee and from approximately B227th Street north overland across Breezy Point, thence eastward from B222nd Street to B201st Street. Approximately 450,000 cubic yards of sediment required for levee construction. Concrete floodwall south along B201st Street extending east along north side of Rockaway Boulevard to B184th Street, thence north to existing shoreline. Concrete floodwall continues east to storm surge barrier approximately 2,300 ft. east of the Gil Hodges Memorial Bridge/Marine Parkway Bridge. A 3,970-foot storm surge barrier across Rockaway Inlet from near Jacob Riis Park to Floyd Bennet Field. The public comment period will open on Sept. 2 and end on Nov. 2, according to the USACE. For more information, visit nan.usace.army.mil.